Free Beer and App P.E.D. The price elasticity of demand for iOS Apps is extremely difficult to ascertain and differs by category. Because Apps are “Experience Goods” (quality is difficult to determine prior to consumption), some apps even exhibit positive PED as consumers assume higher priced apps may be higher quality. What amazes me most is the effect on demand between $0.99 and free. No other product or service in the history of the world has such a negative PED at that point on the curve except maybe beer. (Think all-you-can-drink FREE Beer today posted at the entrance to the Rose Bowl). An ad-free, free app that is getting 1,000,000 downloads a day might easily drop to 1,000 downloads a day and visa versa. Why would a MILLION people be willing to spend the five minutes it takes to read about, download, enter password and launch and play with an app yet only 1/10th of 1 percent of those people be willing to spend 99 cents for the same product and time investment? I believe the correct price point for Camera+, for example, is $1.99 (PED exactly 1) but fear likely keeps them from raising it back up to that price. The danger is that at $0.99 they are much more likely to get dethroned every week by the next trendy Instagram Photo Editor. Eventually, there will be several at the same time perhaps even some smart enough to charge $1.99 and then it will be too late to change the price. The key is not just to find the right price point at which PED is 1 but to think long term about whether that’s the most important factor for App Store longevity. This past weekend, I put our award-winning VIDEO CAMERA app on sale for Free. This app has a solid sales history at $7.99, which is almost unheard of on the App Store and especially among Photo & Video apps. In fact, Video Camera is the 2nd highest grossing video app after iMovie in 2012 in a field full of intense competitors. On Friday, the app was floating around #20-#30 Top Grossing in the Photo & Video Category. When I made it free, sales shot up immediately presumably due to our placement in the App Store search results for the term “Video Camera” and the obvious elasticity of price on demand at free vs. $7.99. The first day, we received over 30,000 downloads, on Saturday over 50,000 as various sites picked up and reported the “deal” to their users. Normally, this would have been more than enough downloads to immediately place the app in the top free charts as has happened so many times before. (even just last week with our Math and Secret Sender Apps). However, to my surprise, VIDEO CAMERA was nowhere to be found on any charts in the top 1,000 (Applyzer.com) except Top Grossing (even though it was now free). This concerned me because we were missing out on the compounding effects of showing up high in the free ranks. Sunday night at about 11pm, the app suddenly showed up at #150 top free overall and #11 top free photo & video. Since then, it has been steadily climbing and is now at #122 top free overall with 55,000 downloads yesterday. As I said earlier, I’ve done this “many” times before with substantial predictability. I realize Apple delay’s their results, I understand the alleged 4-day rolling average, I get that Apple changes their algorithms all the time. But I’ve never seen this before. If the results were simply delayed, why didn’t we slowly climb 9000, 765, 525, 221, etc? Why did the app completely disappear and then suddenly reappear at #11? Maybe I’ll never know what happened. What I do know is that it is going to become increasingly more difficult to get even a great 5-star app like Video Camera into the top free results. If 150,000 downloads in 72-hours isn’t enough to show up in the top 1,000 free photo & video category and the apps already there are benefitting from that exposure, what chance does a great new app have at breaking through. When I made the app free for one week in March, it had about the same number of downloads and shot to #20 top free overall in 24 hours. I’m glad we already have the necessary momentum, millions of users and a nearly perfect 5-star rating. My recommendation to new mobile app startups and mobile app investors is to buy rather than build at this stage in the game. The barriers to entry are rising. 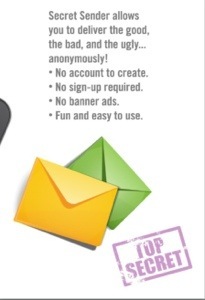 We made Secret Sender FREE today! It has already moved into the Top 50 Free Entertainment apps in under 3 hours! Secret Sender just passed Action Movie FX on the Top Free Entertainment Apps List, now #28! When Apple opened up Push Notifications to developers, they forever changed the dynamics of App Store economics. Although push notifications are intended to be used for important messages relating to the primary purpose of the App, some developers have utilized this messaging platform to push further game play or encourage in-app purchases. However, the real power of push is in notifying users of new versions or even entirely new, related apps. In an electronic age where emails are often ignored and text messaging is considered sacred ground off limits to advertisers, push notifications allow top developers to instantly inform millions of users about an App’s launch. The larger these opt-in push notification lists get, the higher (and more quickly) a developer will be able to push their new version or related app to the top of their respective category and in some cases the top of the entire store. Currently this activity has only a minor effect on the top lists because very few developers have this power and because their releases are relatively infrequent. One day soon, as more top developers grow these lists, the app store top lists will likely look a lot like the Theater Box Office. The charts will be dominated by a select 100-200 developers with the power to drive a thousand paid downloads an hour thru push notifications to their millions of opt-in push subscribers. Those with the most users and largest opt-in push lists will be essentially untouchable in the same way Paramount, Sony and Disney are in the movie business today. In fact, the last three #1’s in the App Store just happened to be launched by developers with very large push notification lists who just happened to notify their users of their new app the moment it came out. Other apps on the list didn’t stand a chance.